Classify each of them on the basis of the following. Question-2 :- How many diagonals does each of the following have? (a) A convex quadrilateral : Two Diagonals. (b) A regular hexagon : Nine Diagonals. (c) A triangle : No Diagonals. Let ABCD is a convex quadrilateral, then we draw a diagonal AC which divides the quadrilateral in two triangles. 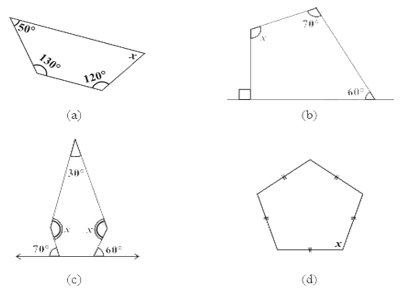 Hence, the sum of measures of the triangles of a convex quadrilateral is 360°. Yes, if quadrilateral is not convex then, this property will also be applied. Let ABCD is a non-convex quadrilateral and join BD, which also divides the quadrilateral in two triangles. A regular polygon: A polygon having all sides of equal length and the interior angles of equal size is known as regular polygon. (i) 3 sides : Polygon having three sides is called a Triangle. (ii) 4 sides : Polygon having four sides is called a Quadrilateral. (iii) 6 sides : Polygon having six sides is called a Hexagon. Question-6 :- Find the angle measure x in the following figures.